Package design is only an adjunct to main reporting here on FixturesCloseUp. 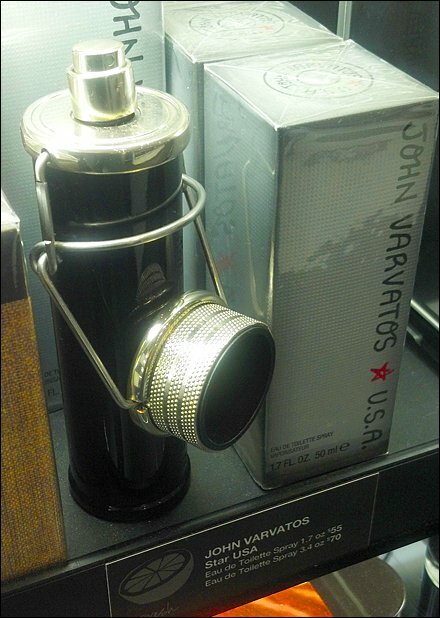 But I had to comment on this totally masculine John Varvatos fragrance decanter and tester. Safety-latch, screw-on covers of this nature are typically only found on camping gear, fuel canisters, canteens, and well-designed captive-top hip flasks for alcohol. So in scanning the rows of fixtures, this tester and flagon drew attention. My wife shops perfume by fragrance (and free satchel with purchase). 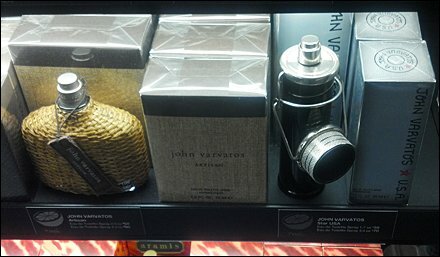 Obviously I shop cologne by what fits my male image of myself … true or not.